In Advent, if we ask how we can be prepared for the coming of Jesus in this new liturgical year, today’s readings are loaded with answers. At the beginning of St. Mark’s Gospel, he announces that Isaiah’s centuries-old prophecy of one who will prepare the way for the coming of the Messiah (spliced together here with Ex. 23:20 and Mal 3:1) has finally been fulfilled. 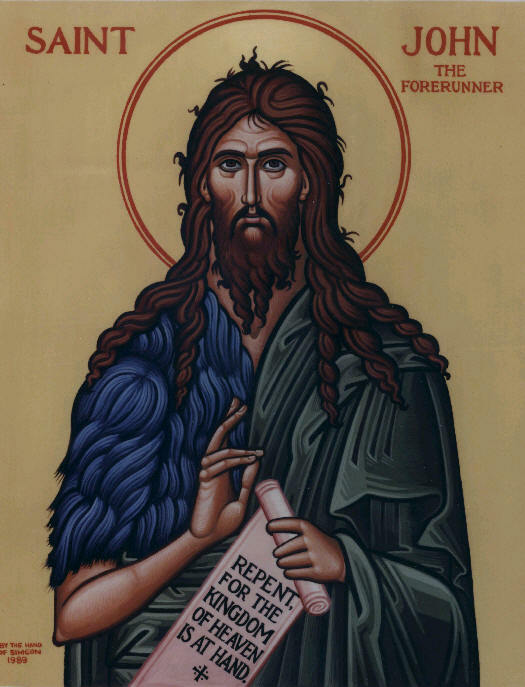 John the Baptist was the “messenger” God sent to prepare His people for this great event. Why would the Messiah need someone to “prepare the way of the LORD”? Why couldn’t He just come and get the work of salvation under way? St. Mark tells us that “John the Baptist appeared in the desert proclaiming a baptism of repentance for the forgiveness of sins.” His somewhat eccentric mission (clothed in camel’s hair and eating locusts) was meant to get the people of Judah thinking about their relationships with God and, in particular, their sins. Why would this be important preparation for the coming of Jesus? If the people had become dulled and indifferent to their sins, if they were smug in the self-righteousness of religious observance, would they ever understand the need of a Messiah who would deliver them from their sin, not from Rome? Without a heartfelt comprehension of how needy and helpless they were to obey God’s commandments, John the Baptist’s description of Jesus as “the Lamb of God Who takes away the sin of the world” (Jn 1:29) would fall on deaf ears. Many people responded to the Baptist’s message. “People of the whole Judean countryside and all the inhabitants of Jerusalem were going out to him.” Apparently, his preaching hit a nerve. There was true contrition “as they acknowledged their sins” and were baptized in the Jordan. John knew that he could not remove the sins of the people. His baptism represented a sinner’s repentance—a recognition that he had not loved God with all his heart, soul, mind, and strength, nor his neighbor as himself. John’s baptism was simply a preparation for the next thing that had to happen. In addition to repentance, the sinner had to undergo re-birth, too. It is one thing to be sorry for our sins and desire to put them away; it is another to have the sins forgiven and to get a new heart for God. Someone Else would have to do that. John told the people about this Someone Else: “One mightier than I is coming after me. I have baptized you with water; He will baptize you with the Holy Spirit.” Once people had gotten as far as repenting of their sins and desiring something better in their lives with God, they would be eager for the baptism with the Holy Spirit. They would be ready for Jesus. John’s work of preparation would be done. The Gospel’s emphasis on repentance as proper preparation for the arrival of Jesus helps us understand why purple is the liturgical color of Advent. This is a penitential season, as is Lent. It is a fresh opportunity to think about our sins and our great need of a Savior from them. If we don’t spend any time in self-examination in Advent, we are not letting it do its full work in us. Happily, our other readings will give us the help we might need to avoid missing the meaning of Advent. Possible response: Lord Jesus, please help me to examine myself during this season of Advent; I want to prepare for You. Here is Isaiah’s prophecy of a “voice [that] cries out: In the desert prepare the way of the LORD!” The first few verses help us understand that God punished Judah for repeated covenant infidelity by sending the people into Exile. That punishment was to come to an end (“she has received from the hand of the LORD double for all her sins”). The prophet looked ahead to a time of comfort, which would include God’s own coming: “Here comes with power the LORD God.” His appearing would be “like a shepherd” who feeds His flock and cares tenderly for them. So, how did Isaiah describe the preparation for this revelation of the glory of God? “Make straight in the wasteland a highway for our God!” If we think about this exhortation as a landscaping metaphor for our own soul work in Advent, we might look for where there are valleys in us, a kind of deficiency or dip or sinking in the virtues of our lives. Those valleys must be filled in. What about the mountains or hills, the obstacles of pride or self-righteousness that puff us up? Those need to be flattened. What about the stumbling stones of temptation that trip us up and hinder our way? They need to be removed, leaving a “plain” that is easy to navigate. If we let Isaiah help us to prepare the way of the LORD in Advent, we will be ready, when our Lord appears, to be gathered into His arms and carried in His bosom. Possible Response: Lord Jesus, I do want to make the rough places in me plain, an open walk for You into my life. Please show me those rough places. The psalm describes for us what it is like for God to be with His people, “glory dwelling in our land.” Because God is goodness itself, His presence will mean that “kindness and truth shall meet; justice and peace shall kiss.” If these are some of the characteristics of God’s presence among men, fulfilled in the Incarnation of Jesus, what sort of preparation is necessary for us to live that way? Even if we simply use the four words mentioned in this reading—kindness, truth, justice, peace—to examine ourselves, to see if they are alive in us, we will certainly not miss the meaning of Advent this year! St. Peter gives us wonderful advice about how to observe our season of waiting. We have been waiting a long time for the Second Coming of Jesus, much longer than the people of St. Peter’s day. Yet he had to encourage them not to be impatient. He assured them that any “delay” had only one purpose—more repentance and more conversions! Jesus is simply giving people more time to be ready when He appears. However, He will appear one day, so it is wise to give thought to “what sort of persons ought [we] to be while waiting for and hastening the coming day of God.” St. Peter suggests we should be people of “holiness and devotion…eager to be found without spot or blemish before Him, at peace.” Here again we see emphasis on preparation by self-examination and a commitment to live the life Jesus has won for us. Possible response: Lord Jesus, thank You for giving me another year in which to be ready for You. Help me resolve to aim for holiness and to be patient in waiting. This entry was posted in Advent, B, Sunday Lectionary Readings. Bookmark the permalink.